Super cozy, easy to prepare, Indian Lentil Soup with Kale & Cilantro. Packed with nutrition & perfectly spiced for maximum flavour! The temperature is set to drop significantly next week and I have plans to have a big pan of this Indian Lentil Soup with Kale & Cilantro bubbling away on the stove to see us through. I can’t wait to cozy up with a piping hot bowl, and a big wedge of freshly made bread slathered in my Vegan Butter on the side. The only good thing about rubbish weather is comfort food IMO and this is comfort food to the max. It’s soup (obvi) but it’s also flavoured with gorgeously fragrant, warming spices which makes it even cozier and gives it a curry-esque type hit which is something that is always welcome with me. 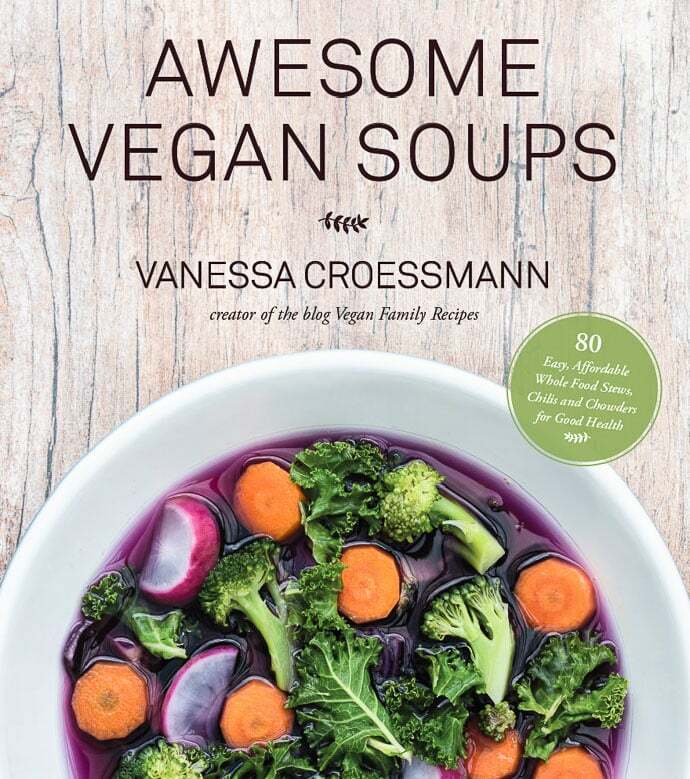 This flavour packed, hearty soup is one of the recipes from Vanessa Croessmann’s new book Awesome Vegan Soups. Vanessa is the creator of the blog Vegan Family Recipes and her book features “80 Easy, Affordable Whole Food Stews, Chilis and Chowders for Good Health”. Vanessa shows how easy it is to incorporate veganism into your life with her plant-based soups, stews and chili recipes. The recipes are all easy, hearty, budget friendly and quick (most are ready in under 30 minutes). The chapters go through the seasons, conveniently starting in Autumn, then moving on through Winter, Spring and Summer, so if you are like me and enjoy eating soups and stews all year round, then this is the book for you. There are so many delicious looking soups and stews that I struggled to choose one to feature today. 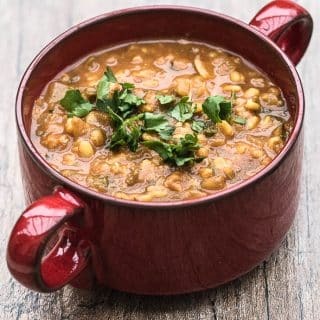 I eventually decided on the Indian Lentil Soup with Kale & Cilantro because I have a bit of a love affair going on with lentils, and because I love using spices in my cooking and this recipe is full of them. It is designed to be made on the stove-top but I have had success making it in my Instant Pot too which makes it even easier. I cook the soup then once the pot has been through a natural pressure release, I turn it off, remove the lid, throw in the kale, put the lid back on and leave it for about 2 minutes, then open again, stir through the cilantro and serve. Easy peasy! I can’t wait to give them a try! 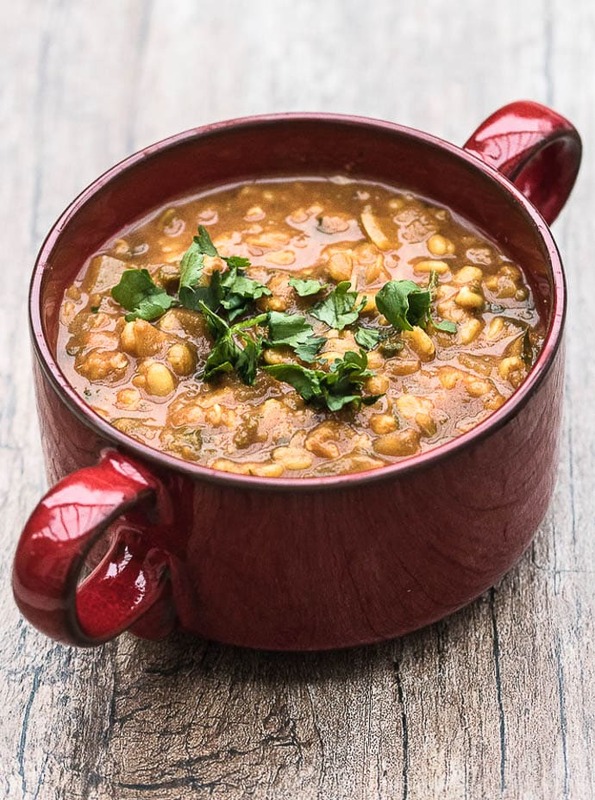 If you try this Indian Lentil Soup with Kale & Cilantro let me know what you think by rating it and leaving a comment below! More lentils! Some people hate and others love them. However, lentils play such a vital role in a whole food, plant-based diet. Not only are they rich in fiber, but are also a great and much-needed source of plant-based iron. Add the vegetable broth, water and lentils to a saucepan and bring it to a boil. Once boiling, reduce the heat and allow the lentils to simmer for 15 minutes until they are tender. While the lentils are cooking, dice the onions. Heat the coconut oil in a pot and add the onions. Cook the onions for 5 minutes until they begin to become translucent. Add the garlic, ginger and spices and cook for 1 to 2 minutes until the spices and garlic become fragrant. Add the tomato puree to the pot. Once the lentils are cooked, add them, along with the water and broth they cooked in, to the pot. Simmer the soup while you remove the thick stems and finely chop the kale. Chop the cilantro now as well before stirring it along with the kale in the pot. Season the soup with salt to taste and garnish with more fresh cilantro. Serve the soup with a piece of whole grain bread. Recipe reprinted with permission from “Awesome Vegan Soups” by Vanessa Croessmann and Page Street Publishing Co.